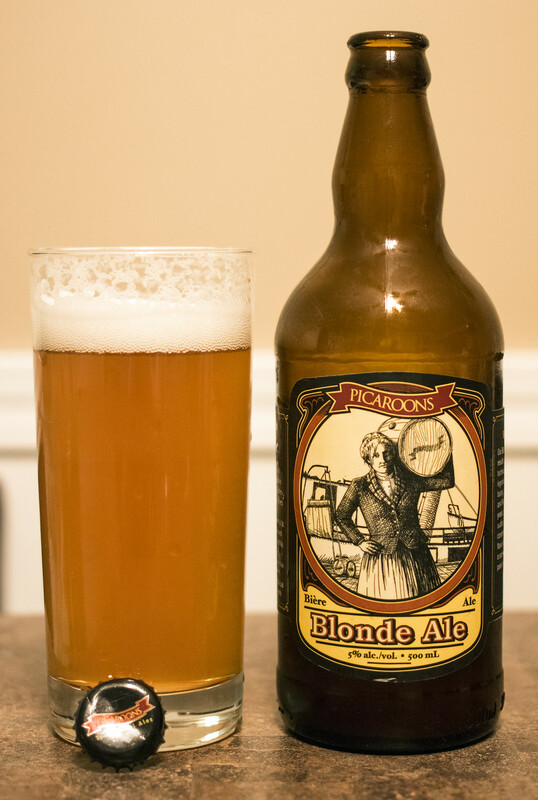 Until 6 months ago, the most popular review I've ever done at BeerCrank.ca was my review of Picaroons' Yippee IPA, now it's down to third most popular review on the website! I've tried a few Picaroons Traditional Ales' beers over the years and Yippee IPA is still my favourite, by far.. but everything I've had by the brewery has been incredibly solid and I love that they use 500mL bottles rather than 650/341mL bottles for the most part - 500mL is the perfect portion size for me. Today I'm checking out their Blonde Ale. Appearance: The Blonde Ale pours cloudy orange with a light amount of carbonation, a good amount of beige head to begin with and diminishes to a half finger's worth of beer as the beer gradually gets savoured. Aroma: The first thing I expected in the beer was that it was going to be a boring crisp golden ale (like Labatt 50, Molson Export) but it's actually pretty aggressive for a golden ale. The aroma is incredibly citrusy, hoppy and aromatic. There's notes of fresh cut alfalfa, a great deal of fruitiness that has fruits like banana, cantaloupe and lemons. Very parfumic. Taste: I'm getting a bit of a soaked barley taste up front, which gives a very sweet, malt forward flavour with a great hop presence complimenting it. There's a great deal of fruitiness - the same fruits I noticed in the aroma, a hint of pine, a bit of bubblegum, light amount of bread and a hint of clove. Sweeter than your typical blonde ale and solid hop presence. Overall Thoughts: Better than expected.. which is always a good thing. It's sweet with various fruity flavours, a hint of bitterness, mildly creamy for mouthfeel, somewhat acidic yet every easy to drink. Quite reminiscent to a summery wheat ale. I was expecting a crisp, light crafty Labatt 50 but was surprisingly impressed that it's not. I'll definitely drink this again.